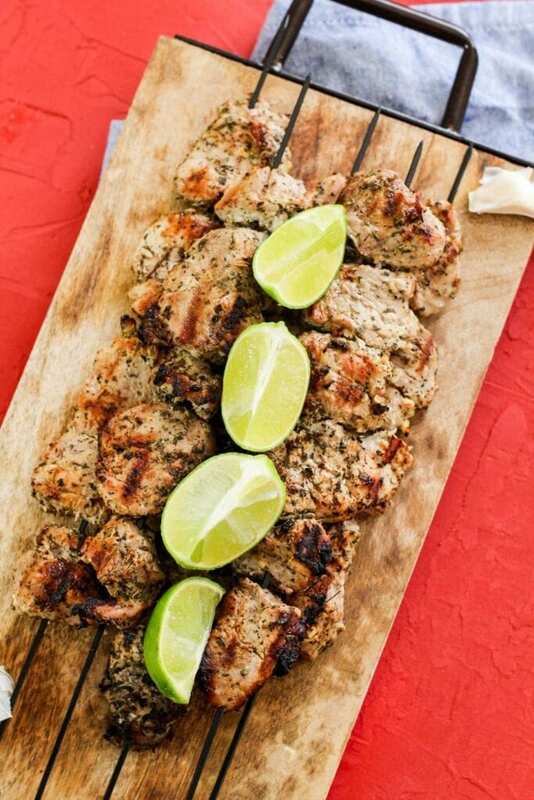 Every Latin BBQ get together has these delicious grilled pinchos, known as shish kabobs in the US. Juicy, flavorful, and conveniently served on a stick. Growing up, eating pinchos was an every weekend event in the summer. The grill was burning with lines of pinchos (skewers) across the grill. My parents were dancing to some bachata and there was cold beer in the cooler (for adults) and cold Pepsi and Coca-Cola for the kids. We were care free and creating memories while honoring our cultures love for grilled pinchos and musica. Pinchos are made of bite size pieces of meat, typically chicken, pork, or beef (or shrimp) that are threaded onto a stick and cooked on the grill or baked in the oven. 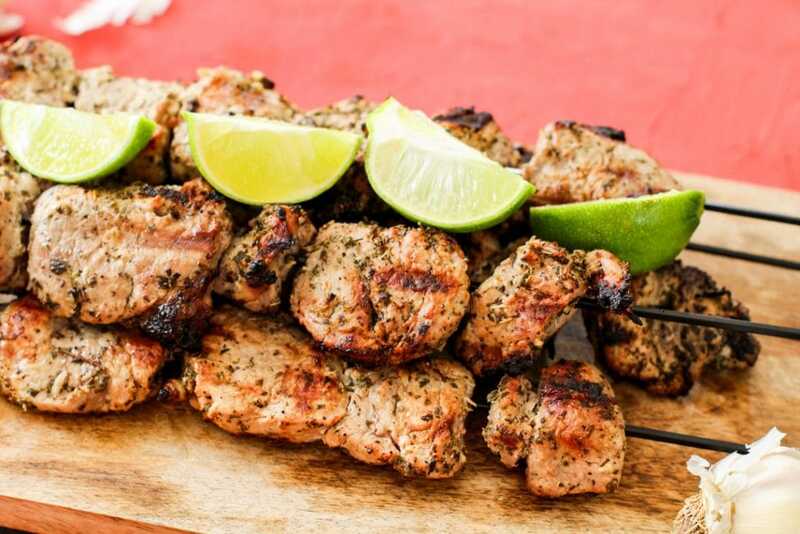 You can make all meat pinchos or add variety by adding some chunks of onions, peppers, pinchos with pineapple, or be creative and design your own shish kabob! 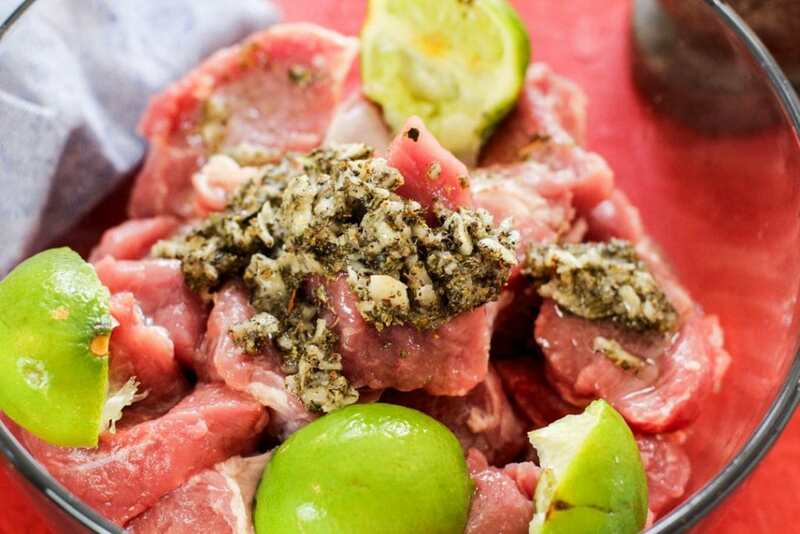 To make Cuban pinchos, we will start out with making the mojo marinade. I love to use a pestle and mortar to really smash the garlic, but if you don’t have one, you can mince your garlic instead. 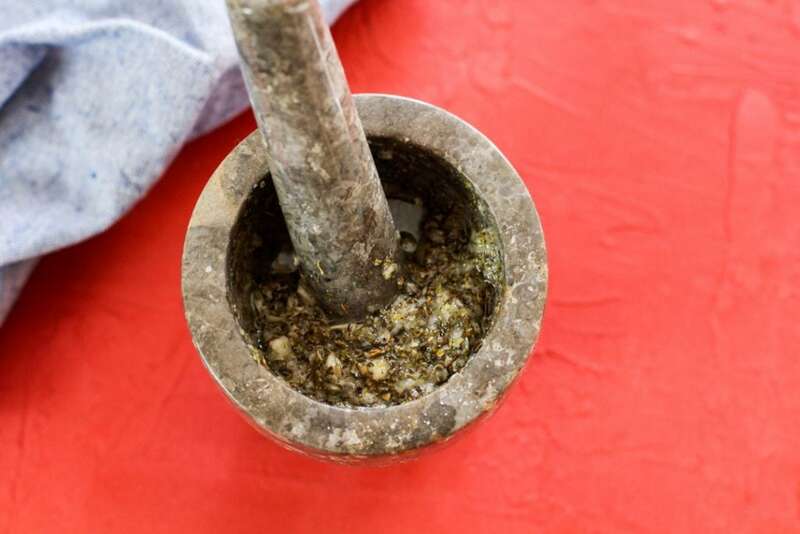 To make this simple Cuban mojo in a mortar and pestle, you’re going to add a big pinch of salt and whole garlic cloves to the center. Start with only this. Now, you’ll mash it together. The salt is like a binder that helps create a paste and keeps the garlic from flying everywhere. Mash the garlic and salt together until a paste forms. Once the paste forms, you’re going to add in the remaining ingredients (except for the pork). If you do not have a mortar and pestle, you can still make this mojo in a small bowl using minced garlic. Next, you’re going to add the mojo paste into a bowl with the pork chunks and mix together to season. Marinate the pork for at least an hour to overnight in the fridge before grilling your pinchos. I like to add the juiced limes to the bowl while marinating. 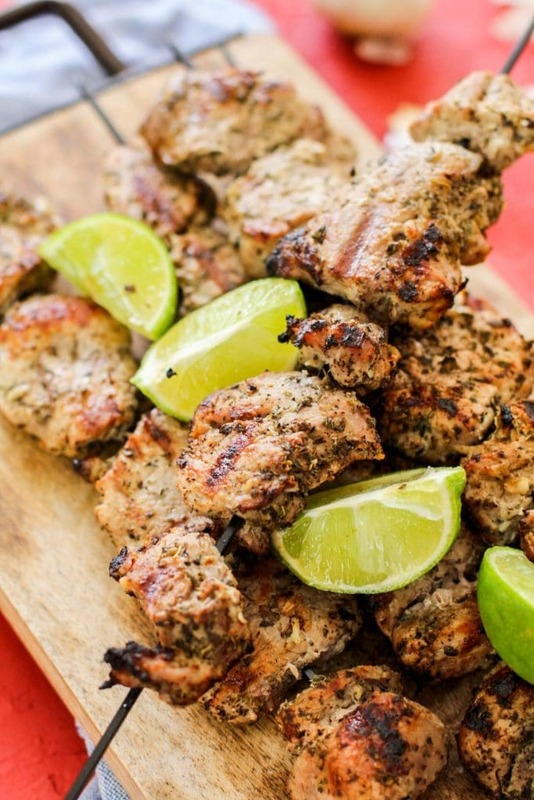 Once your pork has marinated, it’s time to make the pinchos. 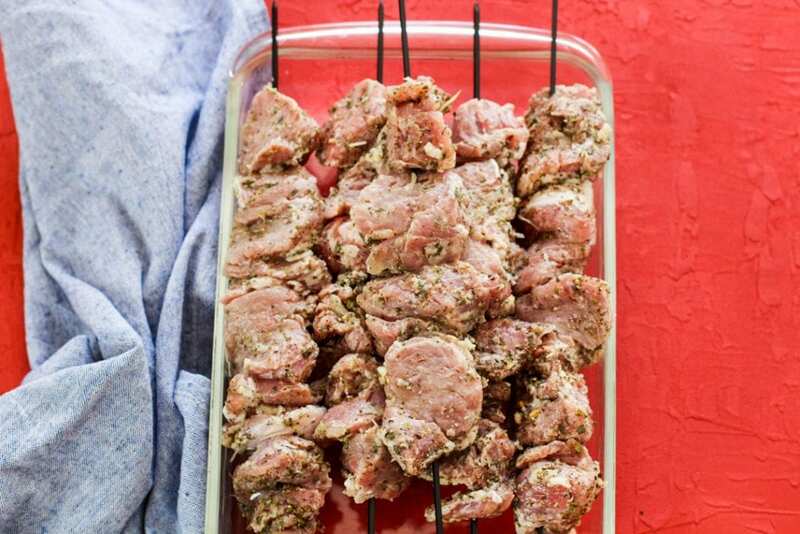 You’re going to take your metal or wooden skewers and thread the pork chunks into them. Keep the pork snug by each other, but allow the pork to sit naturally, not completely squished. If you are using wooden skewers, but sure to soak the skewers in water for at least an hour or two before cooking. For the fun part! To grill pinchos, you’ll want to oil your grill and preheat it over medium high heat. After your grill has preheated, add in your pinchos and close the grill lid. After 4 minutes, flip the pinchos and grill an additional 4 minutes. Depending on the thickness of your pork, it may be done now, if not flip and cook another 4 minutes. Pinchos de puerco typically take 8-12 minutes to cook. Your Cuban pinchos are done once the pork is cooked through and the juices run clear, or if you’re like me, pull out the digital thermometer and check that the temperature is at least 145, but for a nice crisp and true grilling taste, let it get to 165 degrees Fahrenheit. What are pinchos good with? Have you ever eaten pinchos before? If so, what kind is your favorite? Let us know in the comments below!